MK Czerwiec (pronounced sir-wick) has been making comics under the pseudonym Comic Nurse since 2000 – comicnurse.com. She is a Senior Fellow of the George Washington School of Nursing Center for Health Policy and Media Engagement and the Artist-in-Residence at Northwestern Feinberg School of Medicine. With UK physician Ian Williams, she co-runs GraphicMedicine.org a website devoted to the intersection of comics and health. She travels widely teaching and conducting workshops on Graphic Medicine as an educational, reflective, and research tool in health care. She has a bachelor’s degree in English & Philosophy and one in nursing. Her master’s degree is in Medical Humanities and Bioethics from Northwestern University. Her clinical nursing experience is in HIV/AIDS care and hospice care. 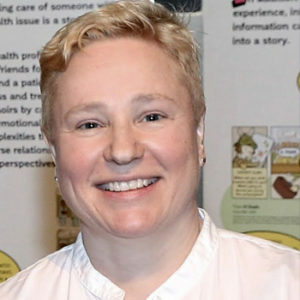 Her first graphic memoir,Taking Turns: Stories from HIV/AIDS Care Unit 371 (Penn State University Press, 2017) is believed to be the first graphic memoir created by a nurse. She is also a co-author of the Eisner Award nominated Graphic Medicine Manifesto (Penn State University Press, 2015) which maps the field of Graphic Medicine. She is also the editor of a forthcoming anthology of comics about menopause.